Rat poison isn’t something that we use joyfully – it’s the type of product we all hope to never have to use. Yet, it’s something that most of us are forced to use at least once in our lifetimes. And when you consider that modern rat poison products are quite complex chemical mixtures that still have a lot of side effects, finding the best rat poison and using it correctly is of the utmost importance. Rat poison is often dangerous to both pets and kids, which is why we often equate all toxic things to rat poison even when they wouldn’t really work as such. Modern rodenticide manufacturers are doing their best to produce poison baits that are as safe for kids and pets as possible but that’s a difficult task considering that what kills rats often kills cats and dogs too. Still, despite their drawbacks, rat poison baits are often more suitable than rat traps because of their ability to affect much larger rat populations. Rat traps that offer repeated uses can also be used on large rat colonies but they take a lot of time and effort and can sometimes never have a 100% effect. Rat poisons, on the other hand, can easily eliminate entire nests and burrows with just one serving. This Bromadiolone Just One Bite rat poison product lives up to its name and deservedly opens up our Top 3 list. With Bromadiolone 0.005% as its active ingredient, this rat killer is fast and efficient. Bromadiolone is a rat poison ingredient that’s anticoagulant of the second generation. This means that unlike other anticoagulants such as warfarin rat poison, Bromadiolone is designed to work even on rats that are already immune to first-generation anticoagulants. Bromadiolone is a 4-hydroxycoumarin derivative and a vitamin K antagonist. This means that, like other anticoagulants, it works by thins the rodents’ blood and causes internal bleeding. It’s quite a nasty way to die, but it is quick and effective. 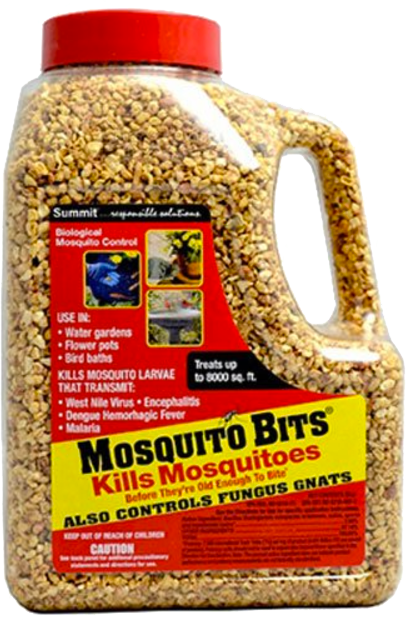 It’s this effectiveness that makes this product one of the best rat poison items on the market out there. The bait itself is very attractive for rats so it does its job of baiting them to eat the rat poison. This way, even if the little critters don’t die after their first tasting they are likely to come back for more and ingest a lethal dose. 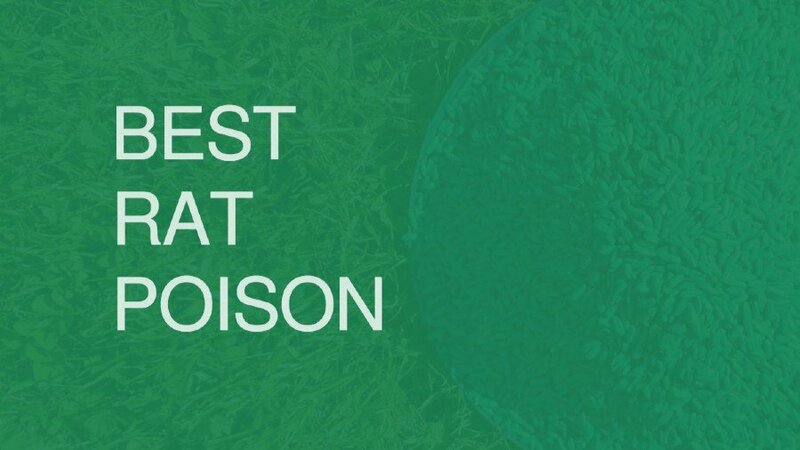 You don’t need to read a ton of Just One Bite rat poison reviews to figure out why it made its way to our Top 3 list. The Just One Bite rat and mouse poison use a powerful second-generation anticoagulant as its active ingredient. This Bromadiolone 0.005% poison ensures death often after just one ingestion. The bait itself is well-scented and very tasty for rodents so as long as it is well-placed it will attract them without a problem. Coming in 8 and 16 oz. 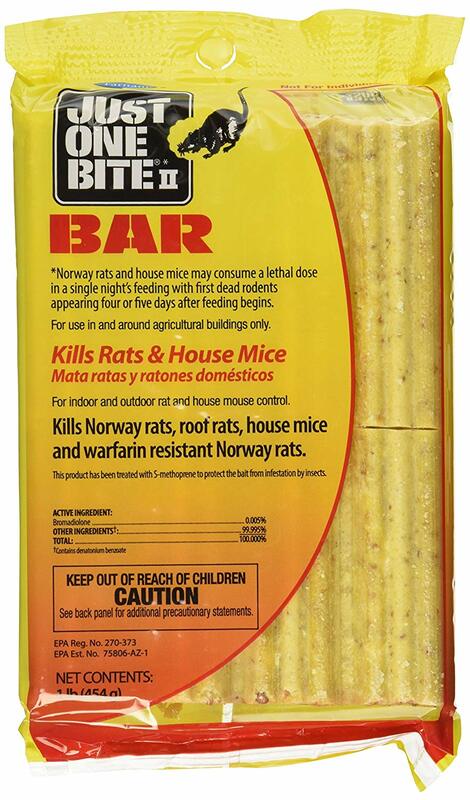 bars, this rat poison bait is enough to handle even large and out of control rat infestations. The rat bait blocks have a hole pierced in the middle of them, making it easier to nail or wire them somewhere to prevent the rats from dragging them away. As all other anticoagulant rat poisons, the Just One Bite rat poison blocks are dangerous for your pets, kids or neighboring wildlife. Make sure that you have enough vitamin K at your disposal should a pet or a child consume some of the poison and be prepared for an emergency doctor/vet visit if need be. Also, make sure to place the rat poison in such locations that incidents of this sort are impossible. Next on our list is the Havoc rat poison. This item has quite a few interesting rat poison ingredients chief among which is the Brodifacoum 0.005%. Like Bromadiolone, Brodifacoum is also a second-generation anticoagulant so it works in a similar way – It is a 4-hydroxycoumarin vitamin K antagonist that works by depleting the rodents’ vitamin K resources and causes internal bleedings. As such, it too is often effective after just one serving. This Brodifacoum rat poison comes as rat poison pellets so it’s suited for both indoor and outdoor use. For an indoor application, it is best used with a bait cup so that the pellets don’t scatter all over the place. This is especially important in households with pets or with small kids as anticoagulants like Brodifacoum are dangerous for people and other mammals as they are for rodents. Should a child or a pet unknowingly consume this Havoc rodenticide make sure to give them vitamin K as soon as possible, as well as to bring them to a medical professional. 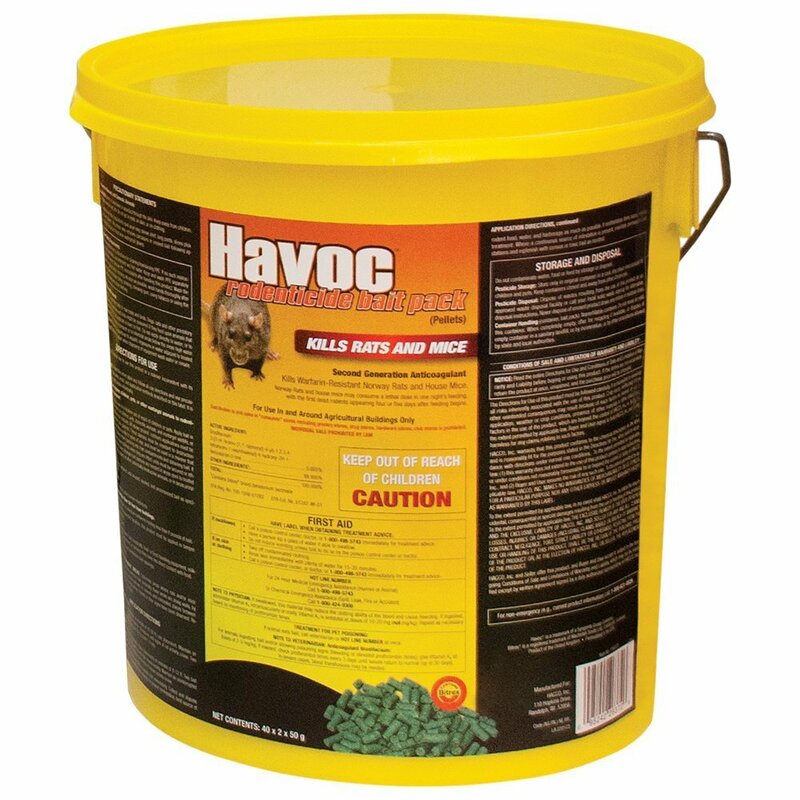 The bait in this Havoc product is more than attractive enough to get the rodents’ interest if you’ve placed it in the right locations, so this is a well-rounded and powerful product. The Havoc Rat Poison uses Brodifacoum 0,005% as its active ingredient. This is a second generation anticoagulant that is really powerful at dealing with all types of rodents after just one serving. This is one of the best poison for killing rats because of its attraction rate as well – this Havoc product is very tasting and well-scented for rodents so it won’t fail to get their attention as long as you’ve placed it in the right locations. 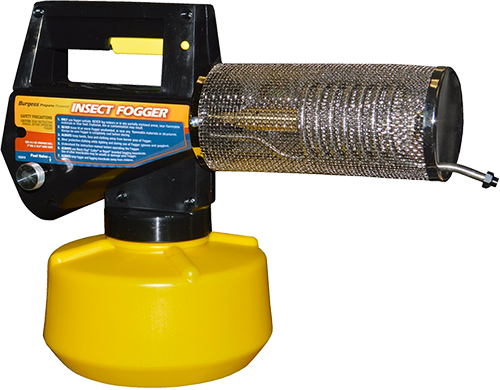 Coming in pellet form, this product is great for both indoor and outdoor use (using a bait cup is advisable, especially in homes with pets or children). As all other anticoagulant rat poisons, the Havoc rat poison pellets are dangerous for your pets, kids or neighboring wildlife. Make sure that you have enough vitamin K at your disposal should a pet or a child consume some of the poison and be prepared for an emergency doctor/vet visit if need be. Also, make sure to place the rat poison in such locations that incidents of this sort are impossible. Another candidate for the title of “Best rat killer” is this Motomco Jaguar rat poison. Like our previous entry, the Motomco also uses Brodifacoum as its active ingredient but it also uses Diphacinone. Diphacinone is a first generation anticoagulant so it works well in combination with a second generation active ingredient such as Brodifacoum. Its purpose is to help deal with rats that have managed to survive the usually lethal first dose. This combination makes this green block rat poison an excellent tool for rat control. As a result of that, the Motomco Jaguar rat poison is one of the strongest rat poison products for dealing with tough rat or mice infestations where resistance is expected. The green blocks themselves have holes inside of them so that they can easily be nailed or wired in place. They are also more than attractive enough for rodents and rats of all types and won’t fail to capture their attention if they are placed in the right places. The Motomco Jaguar rat poison is available in batches of 1.75 pounds, 9 pounds, and 18 pounds, so you can choose a package size that will best suit your needs. The Motomco Jaguar rat poison utilizes two active ingredients – Brodifacoum and Diphacinone. The former is a second-generation anticoagulant and the latter is a first generation anticoagulant. Together, these active ingredients work well against rats of all types and sizes. The Motomco Jaguar rat poison comes in well-sized green cubes that are easy to nail or wire onto anything. 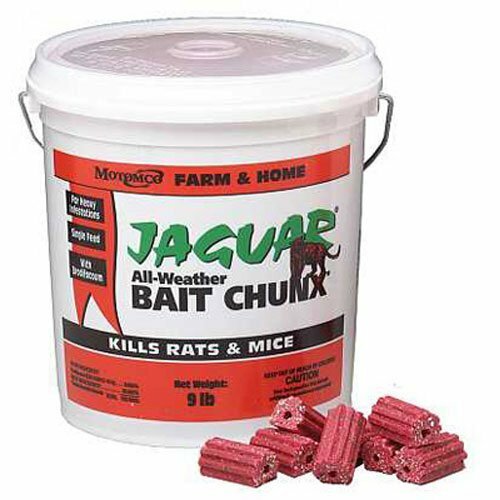 The bait components of these Motomco Jaguar bait chunx are more than tasty and attractive enough to grab the attention of any rodent passing by them. As all other anticoagulant rat poisons, the Motomco Jaguar rat poison blocks are dangerous for your pets, kids or neighboring wildlife. Make sure that you have enough vitamin K at your disposal should a pet or a child consume some of the poison and be prepared for an emergency doctor/vet visit if need be. Also, make sure to place the rat poison in such locations that incidents of this sort are impossible. This Farnam Just One Bite II Rat Poison comes in pellets and uses second-generation anticoagulants so it successfully kills rodents resistant to first-generation active ingredients such as Warfarin. The poison has a delayed effect of 4 – 5 days to prevent bait shyness but that same delayed effect can be its main drawback. Next on the list is this JT Eaton Apple Bait Block Rodenticide. It is highly attractive for rats and rodents and doesn’t fail to grab their attention. However, it does use a first generation anticoagulant only so it may not kill rodents that have developed immunity and need second-generation anticoagulants. This next Tomcat Rat Poison also makes the cut thanks to its strong and powerful effects. It easily kills rodents immune to first generation anticoagulants but it is also quite dangerous for pets and kids. Additionally, while the delayed effect on the poison prevents bait shyness from rodents, it can also be a problem in itself. The second and last entry of JT Eaton Bait Block Rodenticide is similar to the previous one but this one uses peanut butter flavor as its attractant. The active ingredient is a first generation anticoagulant as well, which, once again, is the main drawback of this rodenticide. These Tomcat Rat Poison Blocks contain Bromethalin as their active ingredient. You won’t need to go over too many Tomcat rat poison review sections to agree with us that this poison deserves to be quite well-rated. The Bromethalin is a non-anticoagulant and instead as a neurotoxin that damages the central nervous system of rodents. It’s less dangerous to pets and kids than anticoagulant active ingredients but it should still be kept out of their reach. 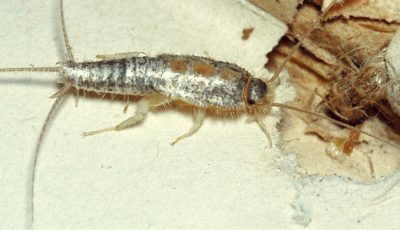 One major drawback of this rat poison is that it attracts cockroaches without killing them. Lastly, we have the Motomco Bromethalin Rat Poison Bait. It works against all types of rats and mice while being less dangerous to pets and kids than anticoagulant rat poisons, although it should still be kept away from them. It attracts mice and rats very strongly, but it also attracts insects which can be a problem because Bromethalin isn’t poisonous to them. Rodenticides come in a lot of different types and mixtures. Most of the rodenticides used in the past (such as strychnine, for example) are forbidden for residential use nowadays and are used just for subterranean professional rat control. Instead, the rat poisons in use today are made in such a way that they have as few side effects as possible. Unfortunately, they are still rat poisons so even the safest rat poison is still highly poisonous upon consumption and should be kept away from the reach of children and pets. That’s why it’s vital to keep the rat poison container in a safe, locked cabinet and to place the poison baits in places where even the smallest cat or toddler can reach. As for the actual different types of rodenticides, here are the several basic ways in which they can differ from one another. Firstly, rodenticides can typically be differentiated as anticoagulants and non-anticoagulants. Anticoagulants are among the most popular types of rat poisons today and they work by thinning the blood of the rodent to such a degree that it can’t clot at all. When this is done the rat starts experiencing extensive internal bleedings and eventually die. In fact, human blood-thinning medicines work on the same principle, but they are offered in such doses that they present no risk to us and only offer their beneficial effects. The way classic blood thinning chemicals such as Warfarin work is that they reduce the amount of vitamin K in the system of the mammal and prevent the organism (particularly the stomach area) from producing any more vitamin K. This is done because it’s precisely vitamin K that helps the blood clot. So, should you, your child, or a pet consume anticoagulant rat poison by accident, the first thing to do is to give them vitamin K if you can, and the second – to get them to a medical professional as soon as possible. With pets, in particular, consuming the corpses of dead rats can also have that effect as the anticoagulant rodenticide will still be inside the corpse. Non-anticoagulant rodenticides, on the other hand, work on various different principles and are only categorized as “non-anticoagulants” because anticoagulants are so popular. One type of non-anticoagulant is the zinc phosphide rat poison. It works by creating an expanding phosphine gas in the stomach of the rodent that kills it very quickly. The plus side of zinc phosphide is that if your pet consumes a rat’s corpse it won’t poison itself. On the other hand, if a pet or a child ingests such rat poison directly from the container or a bait station, the immediate danger is much greater as there is no easy vitamin you can take to help. Other popular non-anticoagulant are calciferols. They work by drastically increasing the amount of vitamin D in the organism which can lead to calcification of vital body organs and thus – death. This is also why consuming too much vitamin D in pill form can be dangerous for humans too. The different uses of anticoagulant and non-anticoagulant rat poisons don’t mean that they can’t be used together, however, to the contrary. A lot of rat poisons us mixes of these two types of active ingredients to achieve an even stronger effect. Another difference between rodenticides – and furthermore between anticoagulant rodenticides – is whether they use first or second generation active ingredients. The difference between the two categories is that first generation anticoagulants such as Warfarin or Chlorophacinone (which are often used in human medicine) have caused rodents to develop immunities to them. Such first generation blood thinners were used in rat poisons for a long time and they are still sometimes used today, but there are too many rats on which they don’t work. Second generation anticoagulants, on the other hand, such as Brodifacoum, Difethialone, Bromadiolone, and others, are much stronger than their first generation counterparts and can work even on rodents that are naturally immune to them. Of course, such second generation active ingredients are even more dangerous to pets and kids, so use them with extra care. And lastly, rodenticides also differ from one another in how quickly they start working – whether they work after just one ingestion or after several. This difference is rather self-explanatory but the implications are several. First ingestion rodenticides are usually more powerful and work quicker, but they are also more dangerous to pets and kids since they can cause problems after even one bite. Multiple ingestion rodenticides, on the other hand, take longer to have an effect but they are safer to use. Quality and strength. As with any other product, quality is always the first thing you should look for. With rodenticides and other pesticides, in particular, quality is vital because lower-quality products won’t do as good of a job and will allow the infestation to grow to a potentially unmanageable size. With rodenticides, the quality you are looking for is exemplified by the power of the product. Regardless of whether we are talking about single-dose or multi-dose rat poisons or for rat poisons that are intended to work after several hours or after several days, it’s always important that they do their job as intended. This is why first-generation anticoagulants started falling from grace in recent decades and second-generation anticoagulants are becoming more and more popular. What type of poison do you need exactly? We already went over the chief differences between anticoagulants and non-anticoagulants, between first and second generation anticoagulants, as well as between single-dose or multi-dose rodenticides, so we won’t do that again. But it’s important to mark these differences and choose the rat poison that best suits your situation. For example, if your property presents the risk that pets or wildlife might eat the dead rats, then something like zinc phosphide might be a good option. On the other hand, if pets or kids might find access to the rat baits themselves or to the rat poison container, then zinc phosphide is a terrible choice and an anticoagulant is a much better option because its effects are treatable. In what form do you want your rodenticide? Rat poisons can come in a lot of different forms – in blocks, in pellets, in liquid form, in pre-set bait stations, and more. Choose what form you need carefully based on the places you intend to put it in. Pellets are best used in bait stations because otherwise they might get scattered across the floor and present risks for your pets and family. Blocks, on the other hand, can usually be kept in place using a nail or a wire that goes through their center but are not suitable for bait stations. 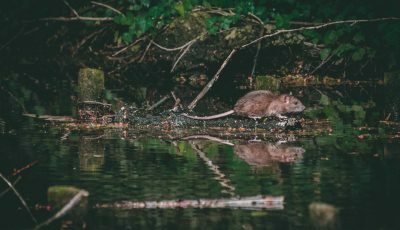 Liquid rodenticides are meant to be added to water sources that rats frequent which is an easy delivery system but also presents risks for pets or wildlife that might also use said water sources. What flavor do you need your rat poison baits to be off? Even though rats are omnivore creatures that can eat almost anything, they still have their preferences. Roof (black) rats generally prefer nuts, fruits, and berries, while Norway (brown) rats are less picky and more gladly eat things such as meats. As a result of that, fruit-scented rat baits are preferable for Roof rats, while peanut butter or meat-flavored rat poison baits are better used against Norway rats. How much rat poison do you need? Obviously, quantity matters. You don’t want to end up with more rat poison than you need (or have leftover poison in and around your property) but you also don’t want to need to make multiple purchases. That’s why it is beneficial to try and determine the exact extent of the rat problem before making the purchase – are you dealing with just several rats or do you have several large colonies on your hands? As you can see, there are quite a lot of things to consider. With the quality question, in particular, there is a lot of research that needs to be done. Unfortunately, said research can be challenging and time-consuming. What’s more, it often takes reading consumer reviews and industry professional reviews in great numbers. The problem with consumer reviews is that they are often subjective, ill-informed, lack context, emotionally-based, inconclusive and often even ill-intentioned. Industry professional reviews, on the other hand, while more informative, are often biased and deceptive. Still, reading large enough numbers of both types is likely to give you a relatively clear picture on which product is the best one for you and your situation. If you need additional guidance on which product to choose, you can also consider the brand of the rodenticides you are wondering about. Branding isn’t a perfect criterion or judging rat poison but it can serve as a relatively good guide. Here are some of the rat poison brands we would recommend: Tomcat, Motomco, Havoc, JT Eaton, Farnam, Just One Bite, and others. One major factor that a lot of rat poison manufacturers fail to address is the problem with rats dying in unreachable places. Of course, there is nothing that rat poison manufactures can do about that, but it is something that consumers should know and keep in mind when they decide on whether and how to use rat poison in their homes. The problem lies in the fact that – unlike with rat traps – poisoned rodents don’t die on the spot. Depending on the poison you’ve used rodents can take anywhere between several hours and several days to die, which is plenty of time for them to get into the most unreachable places. In fact, delayed effects are often lauded as a positive because if the rodents die fast enough the other rats can figure out that they should avoid the poison. And while this is true, it is also a negative in and of itself. What further complicates the problem is that as the poisons start working and the rats start feeling the internal discomfort caused by them, they panic and try to hide as well as possible. As a result, you may well find yourself with dozens of dead rats inside your walls, inside your floors or in a ton of other unreachable locations. If you can’t get the rat corpses out of these places they will just start decomposing and rotting there, emitting an intolerable stench as they do so. Depending on the climate and the temperature this can take between two and several weeks of a rat-smell nightmare. What you can do to avoid this is to try and seal off your property’s hollow places as well as possible beforehand. Or, if you’ve already fallen victim to this problem you can either call a professional exterminator to help you get rid of the corpses or try to use products that absorb unwanted smells. Or, you can just not use rat poison at all and focus your efforts on rat traps. Also, keep in mind that decaying rat corpses are not only unpleasant but they can also attract other pests such as flies or cockroaches which is a whole new set of problems. One last factor to consider outside of just dealing with rat corpses is that you might also need to dispose of unused rat poison as well. In most Western countries it is illegal to just dump rodenticide or other pesticides in the trash as they can have significant environmental and societal effects. Instead, to dispose of rodenticides or of poisoned rats, contact your local trash company and ask them how to proceed – they will be well-informed about the specific local laws and regulations in your country or state, and will give you the best possible advice. You might have to burn the poison and the corpses or to seal them in protective containers and give them to the waste company that serves you. Or, you can just gift or sell your leftover rat poison to a neighbor or a friend in need. Aside from the safety concerns, there is also the question of maximizing the poison’s effectiveness. Rat poison baits are usually made in such a way that they are as scented, tasty and attractive as possible, but they still need to be placed in the right locations. Putting a rat bait station away from the rats’ typical route may be completely ineffective since rats are cautious creatures and don’t like to stray from their familiar paths. Instead, before placing the rat poison make sure that you know exactly where the little pests pass through. Look for scratch and bite marks, as well as for rat droppings to determine their preferred locations. You can also use night vision cameras or non-toxic biomarker rat baits. That combination of needing to place the rat poison in the best location while also making sure that it remains pet-safe and child-safe is the main challenge in using rat poison. Another thing to keep in mind is that you need to keep your property as clean and in an as hygienic state as possible while using rat baits and rat poison. The reason for that is that you want your rat invaders to go for the rat baits and not for anything else you might have lying around such as foot leftovers, nesting materials or just good old dirt. Also, remember not to use rat repellents together with rat poisons as the two have opposite effects and don’t work well together. Lastly, you may want to start sealing off your home and property as you are using rat poison. While you would probably be happy if the rodents die outside of your home instead of inside of it, the former can present a serious environmental risk. 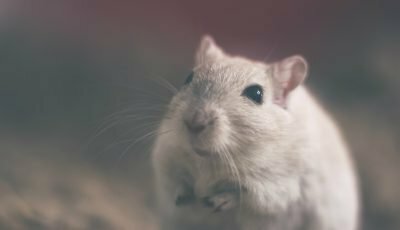 Additionally, a lot of rat poisons tend to be attractive to other pests such as cockroaches or scorpions without actually killing them, so if your property is not well sealed-off you may just trade one pest infestation for another. Rat poisons definitely have their place in rodent control and are roughly on par with non-toxic rat traps in their effectiveness. They have their advantages over rat traps but they also have their rather significant drawbacks, namely the fact that they are dangerous to pets, kids, the wildlife and the environment, as well as that poisoned rats can often die in unreachable places and their smelly corpses can be impossible to remove. Still, good rat poison baits have a much wider range of effect than single-capture rat traps and can help you eliminate entire nests with just one serving which is definitely worth considering. If they are used with proper care and at the right locations, the wildlife, pet and child danger can be removed from the equation and all you can be left with are the benefits – a ton of dead rats. The Just One Bite Rat Killer Poison uses Bromadiolone 0.005% as its active ingredient. Bromadiolone is a second-generation anticoagulant so it is very effective at killing rats and rodents of all types and sizes after just one consumption. The bait is highly attractive to rats as well, so you won’t have troubles getting them to eat it as long as you place it well. The Havoc Rat Poison uses Brodifacoum 0,005% as its active ingredient. This is a second generation anticoagulant so it is very powerful even against rats and rodents typically resistant to anticoagulants. The poison comes in pellet form so it’s easily usable both indoors and outdoors but bait cups are strongly advised to keep it contained. The Motomco Jaguar Rat Poison is among the best rat bait poisons because of its combination of active ingredients. The first generation anticoagulant Diphacinone is well-complimented by the second generation Brodifacoum and the two work well together both as one bite killers as well as repeated serving killers for tougher, bigger rats. This is one of those types of rat poison that impresses both with its effectiveness as well as with its convenience thanks to the nicely-sized green cubes with holes in them for easier nailing or wiring of the poison.